WASHINGTON (AP) — Even given President Barack Obama's own penchant for finding foreign travels eclipsed by distractions, his day-trip to Mexico stands out as a tour de force of multitasking. The president was In Mexico Wednesday for a summit with his North American counterparts — Mexican President Enrique Pena Nieto and Canadian Prime Minister Stephen Harper — to discuss issues of trade, security and energy. Each topic was fraught enough, what with opposition at home for a 12-nation Pacific rim trade deal, a stalled immigration overhaul bill and a pending decision by his administration on a contentious oil pipeline from Canada. But there would be more, and it was not on the original summit agenda. With an eruption of violence in Ukraine, the visit began with Obama, at Pena Nieto's side, demanding that President Viktor Yanukovych's government halt its bloody crackdown on protesters in the streets of Kiev or face consequences. By day's end, he cautiously noted reports of a truce between Yanukovych and the protesters, saying it "could provide space for the sides to resolve their disagreements peacefully." He also condemned violence in Venezuela and called on the President Nicolas Maduro's government to release detained protesters. In between, he applauded a clothing retailer's wage practices, placed a call to Turkish Prime Minister Recep Tayyip Erdogan, and kept enough of an eye on Olympic hockey to know that the U.S. victory over the Czech Republic had set up a U.S.-Canada semifinal clash. In a way, it was a quintessential second-term day, with all its limitations, symbols and modest gestures as well as its focus on foreign affairs. Obama acknowledged that "elements of my party" oppose the Trans-Pacific Partnership deal, but disputed the notion that Democratic concerns would derail the agreement. "We'll get this passed if it's a good agreement," he said in a joint news conference with the two other North American leaders. He signed an executive order cutting back red tape on exports to show determination in the face of congressional inaction. Because press photographers witnessed the signing aboard Air Force One, he called the moment "historic." Then he saluted The Gap for announcing that the company intended to raise wages for their workers beginning this year, drawing attention to his call for a higher minimum wage. Obama's trips have a history of getting overshadowed by events. — Last June, his two-day summit with the Group of Eight industrial economies and his visit to Berlin came after revelations that the National Security Agency had conducted surveillance of foreign communications. — His trip to Brazil and Chile in March 2011 was overwhelmed by U.S. bombing over Libya. — In Seoul in 2012, a live mic caught Obama confiding with Russian President Dmitry Medvedev over the best timing for a missile defense deal. — And in April 2012, allegations of misconduct by Secret Service personnel in Colombia drowned out Obama's participation in the Summit of the Americas, a conclave of more than 30 heads of government from North, South and Central America and the Caribbean. On Wednesday, the violence in Ukraine was clearly the major distraction. Obama, Pena Nieto and Harper discussed it privately and publicly. Obama raised it in his bilateral discussion with both men and then again during the final joint press conference of the day. Asked about Russia's role as a backer of both the Yanukovych government in Ukraine and Bashar Assad's regime in Syria, Obama said he and Russian President Vladimir Putin have different views of the conflicts in both countries. But, he added, "Our approach as the United States is not to see these as some Cold War chessboard in which we're in competition with Russia." Amid talk of expanding North American trade and building energy partnerships among the U.S., Mexico and Canada, Obama also placed his call to Erdogan half a world away to discuss Mideast conflicts in Syria, Iraq and Israel. What made this trip stand out was how many side issues and global worries managed to get squeezed into such a short period of time. 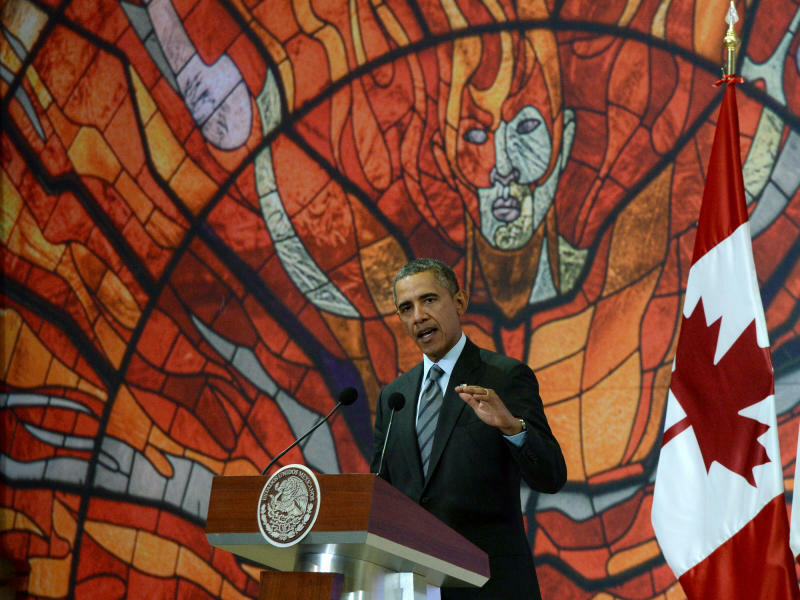 Obama barely spent 9 hours in Toluca. "I'm not here for as long as I would like," he said. It wasn't enough time, he joked, to even sample the city's "famous chorizo."